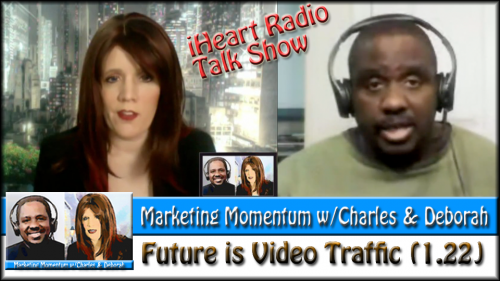 20:00: Charles on topic of “Video Traffic”. 53:00: Nicholas’ Gummy Money on Vine. 10:00: Michael Port YouTube Channel: Book Yourself Solid lustrated - first copy - hot off the press. 35:00: Key to Success: Promotion and Consistency. 04:00: Video Creators YouTube Channel: New Partnership Level Steps Between You and Your Network. Music by Deborah E (yes, one and the same as Deborah in the show), ofdeborah.info. This is really interesting seeing what trends are coming and going! Thanks for sharing! Things change so fast and I never know what to expect! Everyone says video is going to be a great new source of blog traffic. I am trying the vlog thing. I am new to all of this so it is always good to keep learning. Great video tips. Good to know about upcoming traffic sources! Thanks for sharing! I need to take my blog to the next step and start using video for it but I don’t like the idea of being on camera it freaks me out a bit..
i’m working on incorporating more videos into my site — i get so anxious though! I definitely have to become more active on youtube, but I can tell even a difference with the few videos that I have that people are drawn to my blog from youtube a lot more than from other networking hops. This is interesting to see what the next trend will be. Thanks for sharing it with us. I don’t do so well on interviews though. I’m not great with video, but wow, things change fast. I’ve just barely gotten my feet wet with video. This was interesting. Wow, thanks for informing on the growing trends. I know that video is the new wave of the future. I am still getting used to it though. Thanks for sharing this great information. The one thing I loathe about You Tube is that a ton of people are cruel, and make the most ignorant comments. This so awesome thank you! I definitely need to get on the video thing. It’s so handy to do and only takes a few minutes….it’s just the matter of getting over the stagefright! Thanks for this great info. Videos are definitely not my strong suit but I guess I better get learning. Thanks for the info and ideas……I need to learn more about videoing!!! I wish I was faster at editing because that’s what keeps me from doing more of it. Interesting info (and show)! I really need to get on board with using video to create content. It’s definitely an area I need to develop! I’m really not looking forward to video promotional side of gaining traffic. But I know that it’s in the works…..far, far, down the road….for me and my blog! Thanks for the list of resources! I have been hearing from friends that I need to do more videos for my online magazine and your post confirms what I have been hearing from some people I respect. Thanks for sharing your thoughts. my New Year Resolution — to take my blog to the next level – thank you! So much out there for bloggers to learn. I’m a bit overwhelmed with the thought of vlogging, but then again, I never thought I would blog lol! something to work towards… I have alot to do. Thanks! I love making videos so much. They make reviews easier! I was wondering if videos were going to be picking up traffic in the future, I was contemplating vlogging. Not sure yet.